Bruce Conway kicked the first New Zealand Paddles Up inter-school fun kayaking weekend off in Southland in March 1989, assisted by Ann Robinson, Terry McNamara and Andy Wood. Nineteen teams of three (i.e. 57 students), plus adult helpers, from ten Southland & three Otago secondary schools camped for the weekend beside North Mavora Lake. 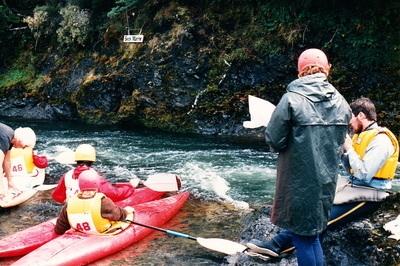 On Saturday morning, free instruction was provided by 14 volunteers (teachers and Southland Canoe Club members) to get beginners up to speed with river skills. Six instructors taught basic skills to the 25 novices, initially on the upper lake by the camp site, then moving onto the river run. 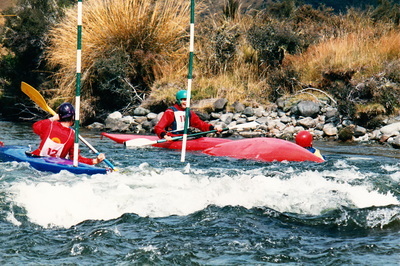 Those students who had done some paddling in the past were taught on the easy ‘between the lakes’ stretch of the Mararoa River. 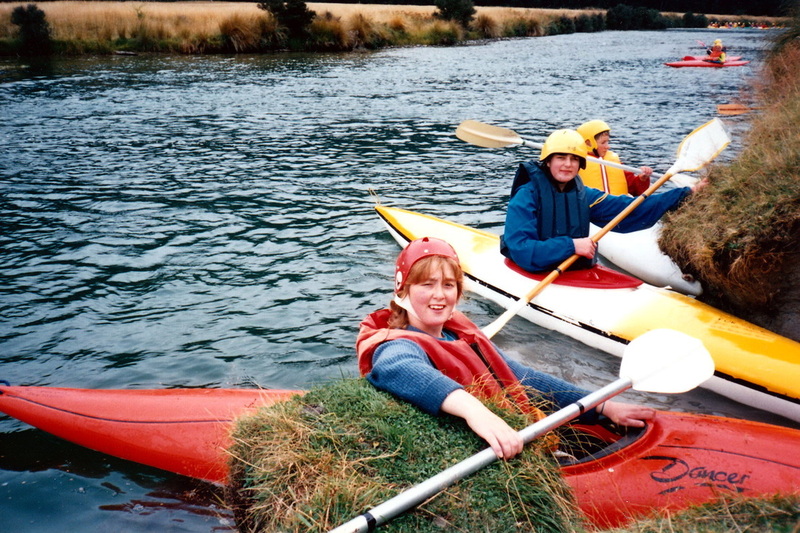 The most experienced paddlers were selected for coaching on the Kiwiburn course (actually they had to erect the course first which took most of their time, so unfortunately they didn't get their coaching!). 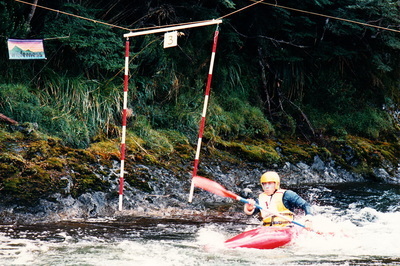 At lunchtime, the downriver race was held on the 1.5km ‘between the lakes’ river run. After lunch everyone drove 10km south to the Kiwiburn swing bridge rapid on the Mararoa River. 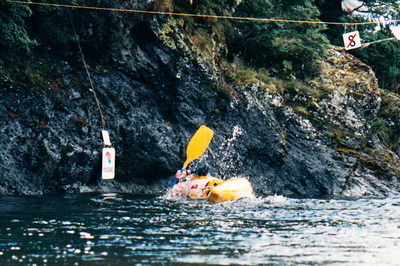 Again, graduated instruction sessions were provided on the fun slalom course, so that everyone had the best chance to feel up to tackling the next day’s event. 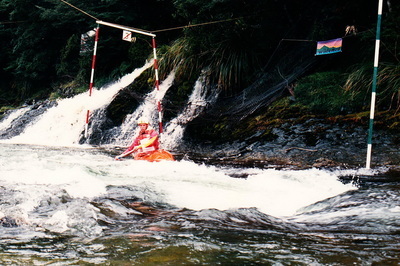 The fun slalom at Paddles Up is not your normal white-water slalom – Bruce modelled it on the spectacular BBC television events run from 1983-1993 in Britain, where experts had to attempt a range of novelty tasks as they paddled down a long grade 3+ rapid. For our purposes the difficulty level was toned down, which saw students ducking under a low limbo bar, eskimo rolling, honking a squeeze horn, tossing their paddle over a high rope, whacking a hanging ball, as well as negotiating the regular downstream and upstream slalom gates on Grade 1 – 2 rapids. Which teams were at the first event? The Lumberjacks (Northern Southland C), Queens Quickies (Queens HS), Dashers (Kingswell HS), Stan & the Men (James Hargest HS), Strugglers (Cargill HS), Wakatipu Wasters (Wakatipu HS) and the Mega Paddles (Fiordland C) to name a few. Add to that another 12 other teams from Southland Girls HS, Gore HS, Waiau C, St Peters C, Aparima C and South Otago HS. 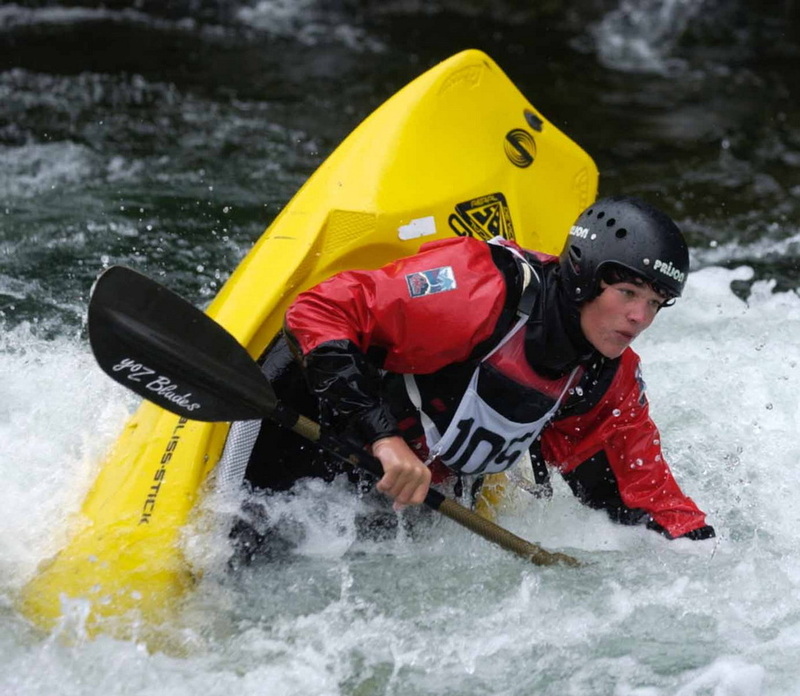 The Yellow Submarines (Tim Haig, Reece McIntyre + Shane Croft from Gore HS) won the boys fun slalom, with the Blazing Paddles (Erik Ashton, Scott Burrows & Joel Surridge from Fiordland C) coming second. The Sniffers (Pam Leishman, Alana Bright + Fiona Billing from SGHS) took out third place, beating 12 boys teams. That won them top spot in the girls fun slalom. 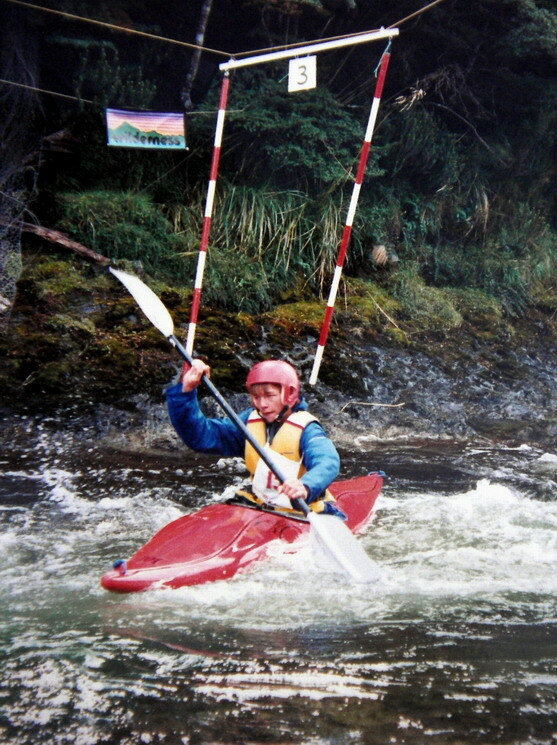 Fiona Billing (SGHS) won both the individual girls slalom and the girls downriver race, while Shane Croft (Gore HS) took out the individual boys fun slalom and the boys downriver. 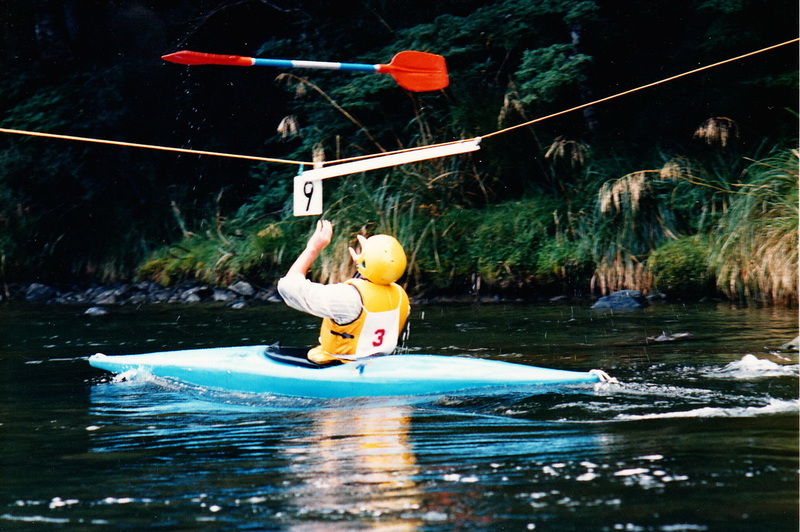 Paddles Up aimed to increase participation, so every competitor stood a good chance of getting a prize, not just the winners. Lots of spot prizes were given out, plus recognition for effort and sportsmanship. In addition, prizes were given to anyone (student or adult) who did something memorable in full public view. Rita Elliot (SGHS) got the prize for most improved girl, and Mark Preece (SPC) was the most improved boy. Steffan Hogh picked up a prize for effort. 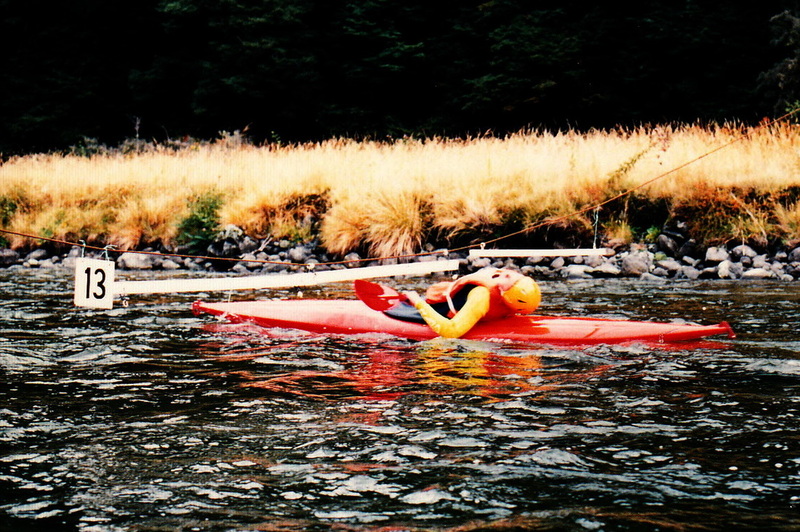 Graeme Swift was rewarded for throwing his paddle away at the paddle toss, and Doug Allan’s display of swimming beside his kayak was recognised (both have gone on to become very accomplished paddlers)! Who else was at the first event? 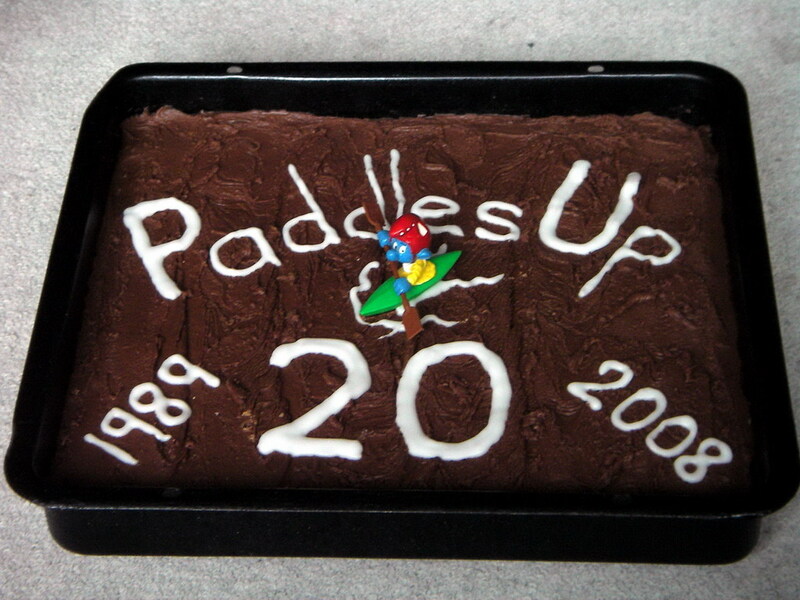 You’d have spotted a few other adults who went on to become regulars at Paddles Up. 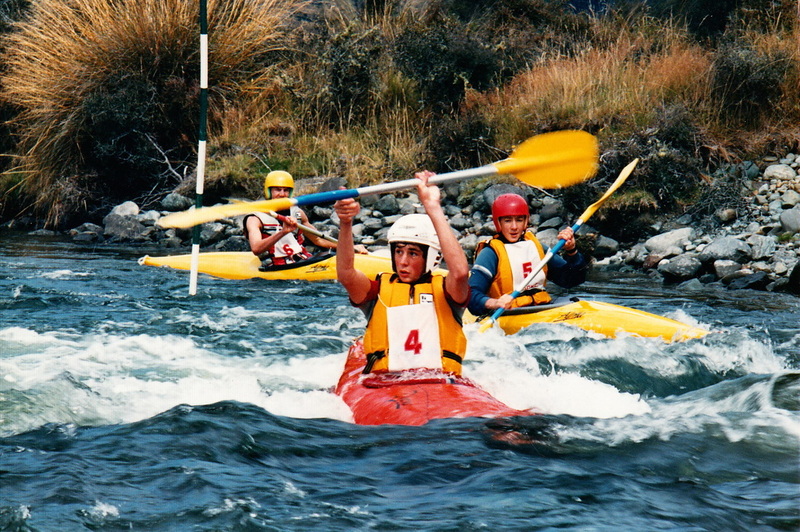 Ken McIntyre with his Klutha Kayakers team from South Otago HS. Murray Welsh with 2 KIngswell HS teams. Pauline Bundo bought 2 Southland Girls HS teams. 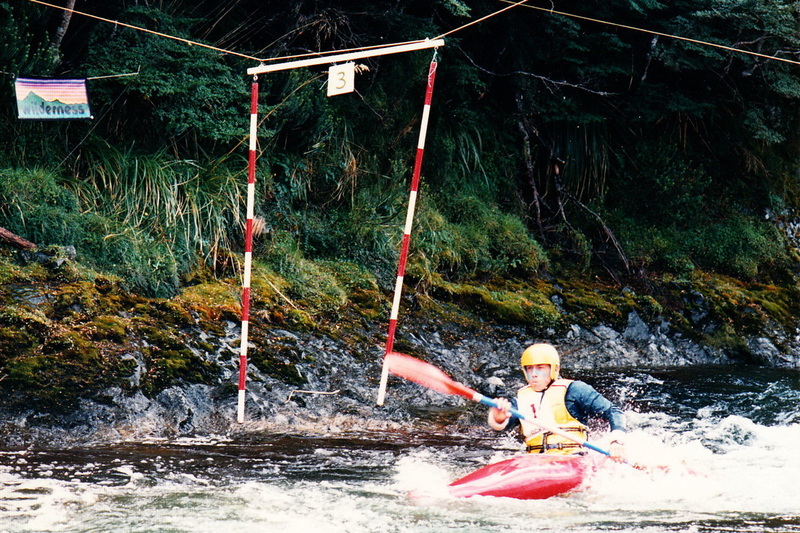 John Surridge and his 2 Fiordland C teams. All you loyal Menzies C fans should note that the irrepressible Pete Holden first came in 1990. Matt Daly, Gary Murdoch, Carl Waddick and Ross Sutherland came from the Southland Canoe Club as instructors. Right from the start we had tremendous support from parents. Mrs Merrilees was one of the first – she and her husband bought a keen team of girls down from Queens HS. The initial sponsor was Outdoor Action (Bruce’s forerunner to Alpha Outdoors), with help from Macpac, Trustbank (later Westpac) and Beck Marine (later Pleasure Boats) , giving a total prize pool of $200. 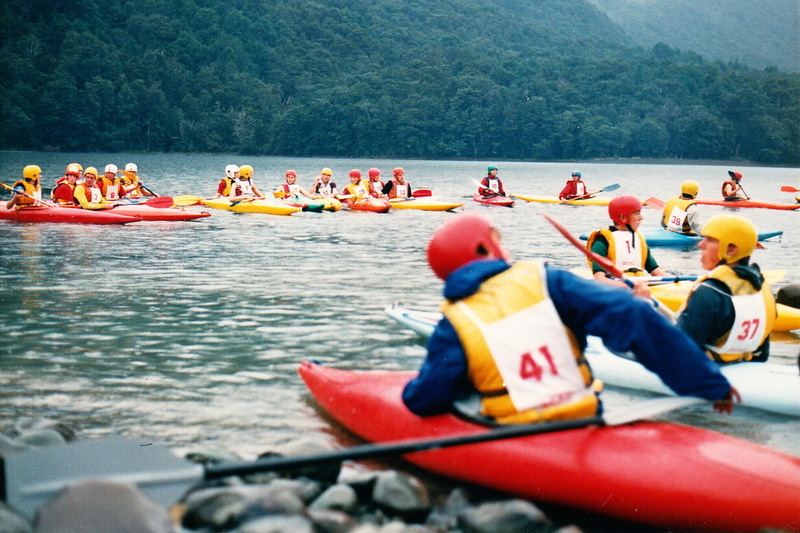 So that any school without a kayak fleet could still take part in Paddles Up, Bruce coordinated the hire of 28 spare kayak sets from CSC, Gore HS, Menzies C, Borland Lodge, SCC and OCKC. 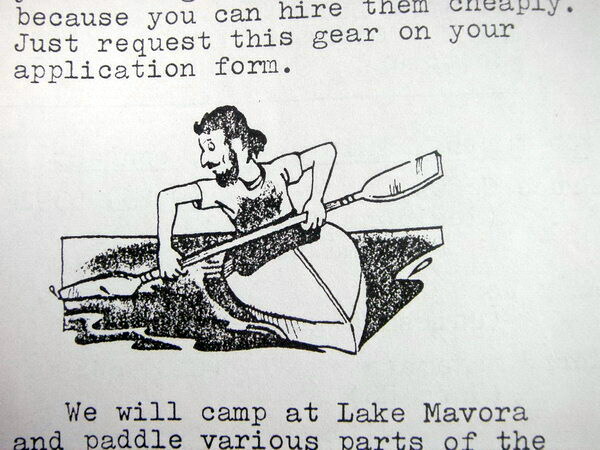 By 1990, its second year, word had got out about Paddles Up. 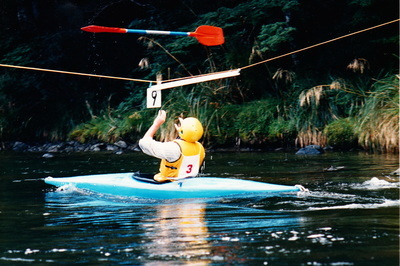 The competitor numbers swelled to 144 paddlers. Bruce increased his efforts with organisation and sponsorship (over $1000 of prizes were up for grabs). 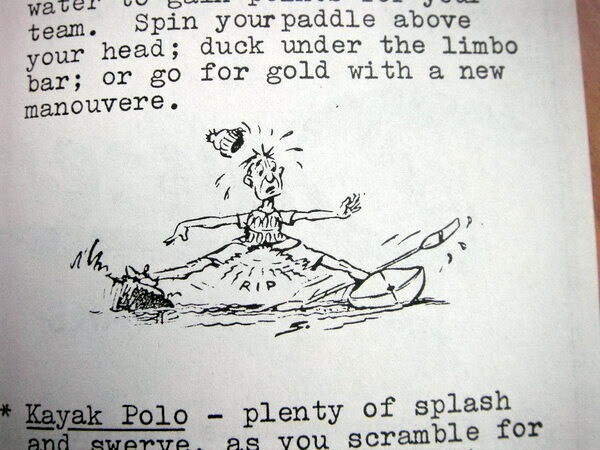 But is was organised chaos – a ridiculous number of paddlers jammed into the eddies during instruction sessions, not to mention the kayaks lying underfoot in the car park and along riverbanks! 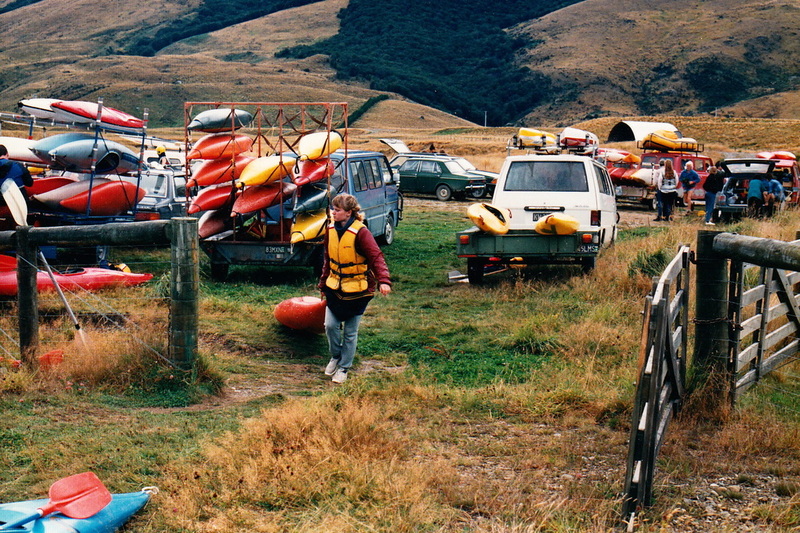 From 1991, Otago ran its own event and the Southland Paddles Up weekend was capped at 33 teams. 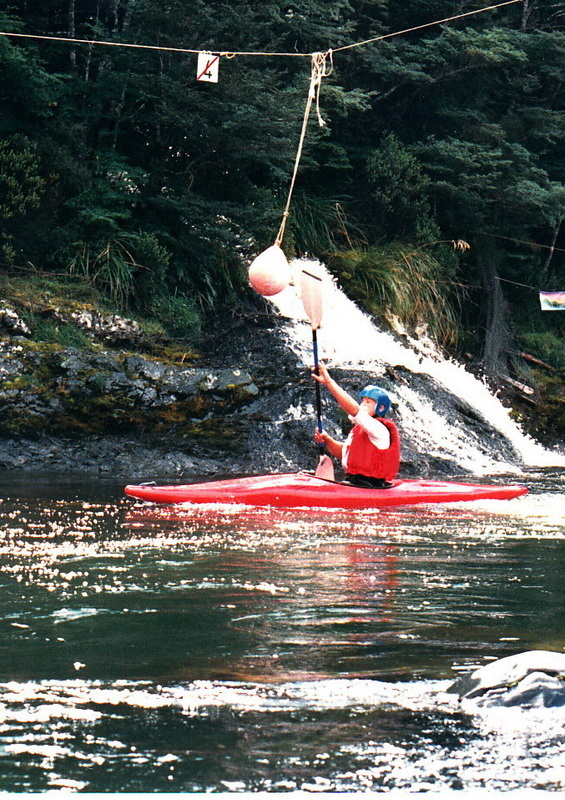 Bruce soon added a rodeo competition to the programme, where the best (or craziest) paddlers performed tricks on a playwave or foaming stopper. Endos, pirouettes, spins, whoopees, etc. This proved to be highly popular, with people clambering down the rocks to cheer and laugh at the antics. Suddenly 20 years have passed and now 25! 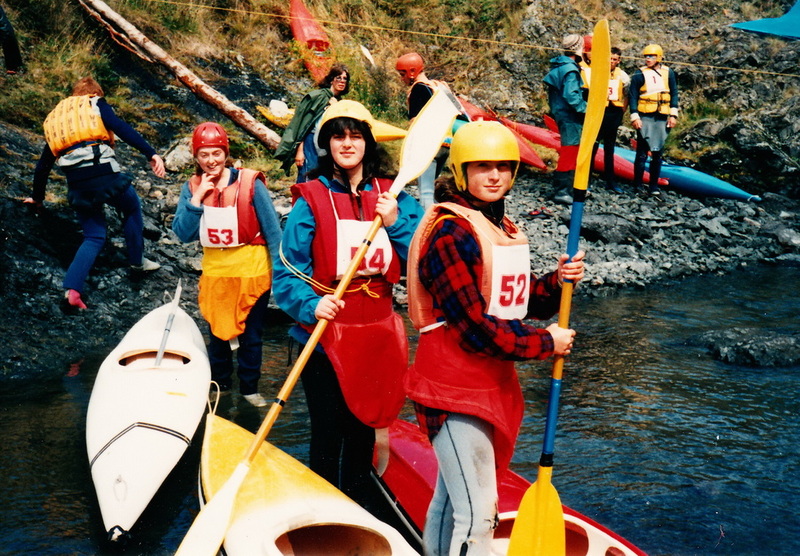 Within a couple of years, the Paddles Up ethos, programme, event rules and management had been fine-tuned. Bruce had handed over the running to an enthusiastic committee. Over the past 25 years, many teachers, parents and club members have pitched in to make this event run. A huge thanks to them all. It’s always been a great weekend, keenly looked forward to by kids and adults alike.